So many people were worried that once the Osborne holiday lights were taken down from Hollywood Studios to make way for Toy Story Land and Galaxy's Edge (Star Wars Land), the holiday spirit would be lost at Hollywood Studios. And I can attest as I was there last year, the festive air was somewhat lacking as the park was still in its transitional phase. Jingle Bell, Jingle BAM was a great addition, though, and hearing the creator speak about it during Destination D was certainly a delight. But there was just a little something else missing last year. GOOD NEWS though! This year, that park has a terrific holiday feel and I'm going to tell you why. The first major change, and one that was sorely needed, was moving the Christmas tree to the INSIDE of the park. It was always odd that this (and Animal Kingdom) had their trees on the outside of the entrance, but it seemed even more out of the way for Hollywood Studios- so many people would just rush by to get through bag check and the gate. At least with Animal Kingdom, hiding the very out of place Christmas tree in the front of the park suits the overall theming of that park. But simply relocating the tree to inside the park, and inside Echo Lake, the holiday spirit now resides right in a key area of the park. And not only is the tree in the lake, but there are giant Christmas ornaments (that light up at night!) in the lake- even Gertie has gotten into the holiday spirit sporting a red cap and holding an ornament! Along with bringing the tree to Echo Lake, the imagineers went to work to really bring that vintage feel to the area with retro style decor, reminiscent of the era inspired by Hollywood & Vine or the 50's Prime Time restaurants that sit along Echo Lake. Add in the jazzy holiday music that plays over the park loop and your old-fashioned holiday atmosphere is set! The next big change this year is down Sunset Blvd. Each year Disney's projection game has seemingly gotten better and better. Well, this year's projections on the Hollywood Tower of Terror do not disappoint! Not only are there timed projections (about every 5-10 minutes) that take place, but they have installed 2 giant screens along Sunset that help introduce what theme will be taking place on the Tower, all brought to the guests by our Prep & Landing elves themselves! The cycle is similar to the projections on the Tree of Life at Animal Kingdom where the music cues indicate that the show will begin and each cycle has a different theme- The Muppets, Toy Story, Olaf and Frozen, and an overall holiday theme. 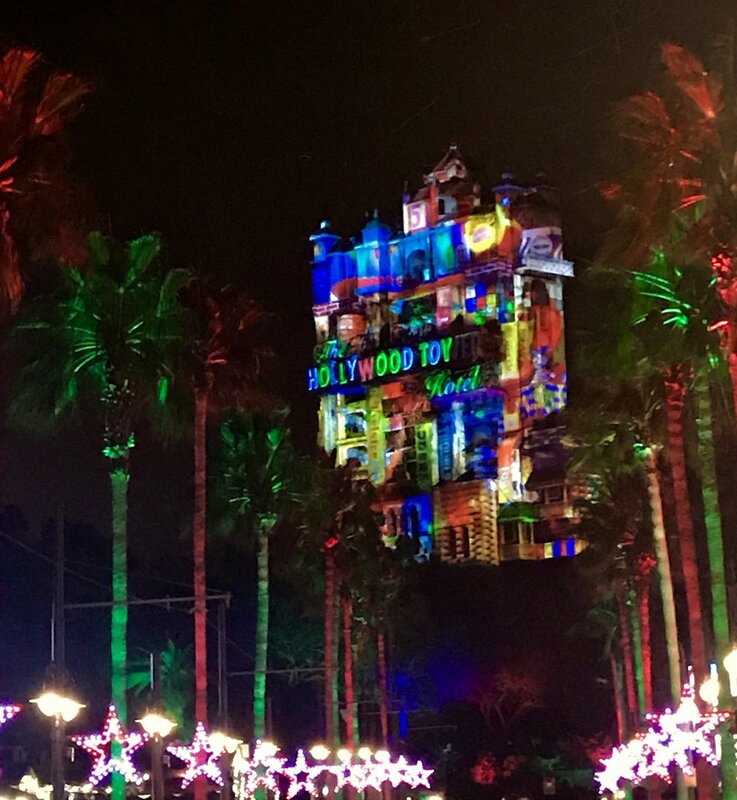 Along with the projections on the Tower, the lights on the palm trees and the stars also change with the beat of the music- very reminiscent of the Osborne lights! Just another avenue (or boulevard in this case) where the holiday spirit is alive in the park. And the topper of the night is the Jingle Bell, Jingle BAM show. Now, as someone who has never seen the Prep & Landing shorts, I was unsure how this show would sit with me since I didn't know the content. However, there was no need to worry. The best part of this show, besides Oogie Boogie, is that there are constantly clips of Disney movies being projected up featuring certain themes, such as snow/ice skating, family/friendships, and romantic love. The music is also very fitting for this park, with the finally being set to Rockin' Around the Christmas Tree! This year, the show also features many more fireworks than last year- almost a full 180 degrees of fireworks! It's a very upbeat show and really speaks to my sense of the holidays. I think I can say that this park is really become a favorite during the holidays- and the new parts of the park aren't even open yet!